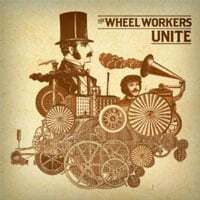 The Wheel Workers, with its steam train and labor union imagery, roll by surprisingly gently, with sweet-natured and highly memorable indie-pop and poetic, dream-like lyrics. The opening track has vintage flourishes, like tinny horns and ukulele invoking old-timey Americana. It’s a quirky tune but an outlier on the album. “Unite” is mostly honey-dipped lo-fi indie rock with smart songwriting and a pastoral, Christmastime feeling of goodwill and warmth. “Stereomad” might be the most enchanting indie song I’ve heard since early Arcade Fire, and far less fussy than that band. The cascading, carol-like male-female vocals on that track are wonderful. I had to listen to it three times in a row (and then twice more when the album finished). “Open Door” picks up the pace and is so catchy the CDC should issue a warning about it. It has the clean drive of a good REM song. The rest of the album falls more on the gauzy, lo-fi side. They do it very well: the thumping percussion, theremin, and vibraphoney keys on “Spidermazes” is perfectly matched with the harmonic vocals. “Epicenter” is welcomingly lulling and another fine example of the band’s male-female harmonizing. The softest songs, however – “Hey Man” and “Soft,” natch – might be a little too narcotic. The weakest track, “Everywhere at Dawn,” has a sax-on-the-beach sound that pushes it dangerously into light jazz territory. Like “Open Door,” the closer “The Seal and Whale” has a pulsing alternative energy, whose choruses are like a gospel choir crescendo. It’s an uplifting way to end a beautiful album. It’s not a surprise that the band counts Wilco and the Decembrists as influences, and those fans should take note. But there are moments on “Unite” that are so pretty, it should appeal to anyone who enjoys a nice, feel-good indie or folk tune. Bottom Line: A few too-tame dips, but the “notable tracks” make this a must-have.